If you are considering Workbench or Print but are concerned about the security of your company's intellectual property on a cloud platform, please take a look at our Security Whitepaper. 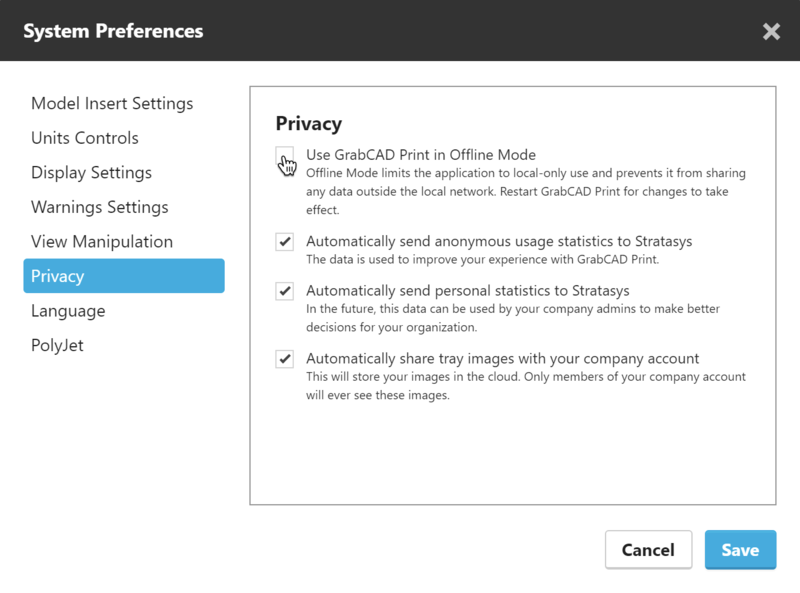 GrabCAD takes the privacy of our users' data very seriously, and we want you to be completely confident that your IP remains entirely yours while you are using GrabCAD Print and Workbench. What data does GrabCAD gather? The data we gather is product usage statistics. We track the overall activity of certain events to learn how people use the product in general. This helps us understand our users at large and helps make the product better. For instance, if we notice that 60% of users change the project settings right after making a new Workbench project, we might change the experience so that the settings are visible right away. Or if we add a new units switching feature for Print, and we find that that 80% of users who have Spanish selected have switched their units to metric, we might make it so that metric is the default units for the Spanish language setting. We gather generic data about the jobs you print, such as number of bodies on a tray and CAD file type. We do NOT gather the names of any files, or any 3D data or geometry. Some of this data is actually what powers our Reports feature! When you are connected to your printers locally, your job file is sent directly to your printer. It is not sent through GrabCAD at all. A preview image of the job is shown in the Job Details in the schedule view, and is visible to all members of your company account, and anyone locally connected to this printer through GrabCAD Print. The images can be disabled in System Preferences > Privacy. Offline Mode stops all internet connectivity. Learn more. Files uploaded to Workbench are not accessed by GrabCAD employees unless specifically invited as part of a customer support request.